" Humans have the responsibility to protect life and our planet "
Juan Miguel Artigas Azas is a naturalist living in San Luis Potosí, Mexico (actually, the very center of it). He has been passionate about fish ever since he can remember. Although his main interest is Central American fishes, he studies and is drawn to many other species and locales as well. 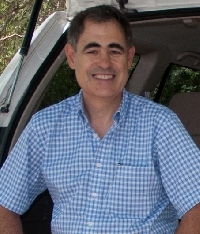 As creator and editor of the Cichlid Room Companion, Juan Miguel found that his strengths in both the computer and the natural world coincided with the revolution of the internet - an opportunity that lead to the vision of bringing them together in a venture for a site that could pass along the formation to cichlid aficionados and scientists for years to come! Juan has found this never ending project a commitment that he has been willing to maintain with fresh and invaluable scientific content uninterruptedly for over 20 years now. Juan Miguel enjoys traveling to the natural habitats of the fish he loves, where he obtains underwater pictures of them. He likes to observe them, trying to understand their natural history and relationships. He has managed to obtain a great knowledge on the biology and geographical distribution of the fishes in Mexico and Central America. This brings to his conferences an originality and special interest aspect to a world of intricate behaviors and spectacular endemic species of the region. Juan Miguel has written many articles on Mexican and Central American freshwater fish for several publications. He has also been honored with the invitation as lecturer in fish oriented conventions in several countries, including Australia, Belgium, Canada, England, Germany, Mexico, Netherlands, Norway, France, Italy, Sweden and the United States. Juan Miguel is part of the American Cichlid Association - Marineland speakers program. Juan Miguel has been awarded the Guy Jordan Retrospective Award 2008 by the American Cichlid Association. The maximum honor this association gives to people who has done extensive contributions to the International Cichlid Hobby. Herichthys, the northern cichlids; In this talk the species, distribution, behavior, habitats of the Northeastern Mexico cichlids are discussed and illustrated with maps and hundreds of habitat and underwater pictures of Herichthys and other fishes that inhabit with them. Aquarist guides for the successful keeping and breeding of these beauties are also given. (Approximate Duration: 90 minutes). Central American Rheophilus Cichlids; In this talk the species, distribution, behavior and habitats of the Central American cichlids that inhabit in river currents are discussed and illustrated with maps and hundreds of habitat and underwater pictures of the species treated and other fishes that inhabit with them. Aquarist guides for the successful keeping and breeding of these beauties are also given. (Approximate Duration: 90 minutes). Thorichthys, jewels of the Mayan land: In this talk the species, distribution, habitats and behavior of this fabulous group of central American cichlids is discussed and illustrated with maps and hundreds of habitat and underwater pictures of Thorichthys and other fishes that inhabit with them. Aquarist guides for the successful keeping of these beauties are also given. (Approximate Duration: 90 minutes). Introduction to Live-bearers from Mexico; Mexico is a land of live-bearers, in this talk the several groups inhabiting the country are discussed, with notes on their distribution, habitat and the several species living with them. The talk is illustrated with maps, habitat and many species pictures, most of them taken underwater in habitat. (Approximate Duration: 90 minutes).